I love rock music. The good old fashioned kind. Electric guitars, bass guitars, drums and some dude wailing. Real, new rock is hard to come by. When I am in Pittsburgh I listen to WDVE and when I am in Philly it’s WMMR. These two along with WMMS in Cleveland are consistently the top rock stations in the east. I’m not talking alternative, acid, death metal, or punk just straight up rock and roll. There is one reason that I love rock music; It makes me feel good. It is fun and allows you to scream lyrics and rattle the dashboard with bass. I like all kinds of music: my playlists have something from just about every genre. But to feel good, I can’t wait until I get to those points on the PA Turnpike where i can begin to hear DVE or WMMS. There is a point to this that relates to education. Just keep reading. As I think I mentioned before, my number one professional goal for the year is to bring the fun. I’m trying hard to bring the joy with me to work every day. The goal is to improve the culture in a positive way. To do everything in my power to suppress the negative and accentuate the positive. Let’s be honest, working in public education isn’t something that we chose to do for the glory, the paycheck or the constant positives from the public. We got in to education to impact lives. Little lives or big lives, at some point we all wanted to make a positive impact. We can’t do that with a negative attitude. We need to be All In Every Day! All in for our kids and all in for ourselves. We have a very finite window in which to complete our life’s work. Like The Struts say: Don’t let your life be an untold story; Don’t live as an unsung melody. I’m probably driving the staff nuts (and my family) but I am committing to writing my story everyday and I am committed to Bringing the Fun; Bringing the Joy! Of course, like most things, I thought about thus statement in the context of education. I know, I’m a nerd. 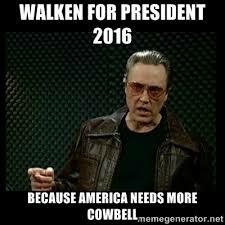 But think about what the cowbell signifies. Cowbells are the joy! When you here a heavy, clapping cowbell you know there is a celebration. A hero in our midst. A fan trying to muster the last bit of energy for his or her team. I have made it one of my goals this school year to bring the joy; bring the fun everyday. When I am having fun and enjoying my work I fell like I am better at my job. People tend to connect more with people who are bringing the enthusiasm to work. It has benefited me to relax the facade of the expected principal and take ‘selfies’ with the kids, interrupt their class to get them a little wound up. The staff seems more at ease when they see the real me and know that when its serious we will be serious. Making connections and building relationships makes it easier when you have to have the unpleasant conversations. So in education, what is the cowbell? In my reflection, the cowbell is the times that you relax a little and not only enjoy your job but genuinely enjoy your students.The cowbell is the times that you celebrate the achievements of your staff and your kids. The cowbell is the times that you remember to ask your staff about their families or things you know that are going on in their lives. The cowbell is the sincere, straightforward ‘thank you’ to staff and students for making this place a great place to work. The cowbell is calling parents to tell them their kid didn’t something wonderful. If you have ever heard a cowbell, you know when you’ve heard it. You know what instrument makes that sound and it is clear and unmistakable. It’s important to keep that in mind no matter what your cowbell is. Everyone knows when they are not hearing a cowbell. They know when you are blowing wind up their skirt. Does Education Have a Fever? I don’t know if I have that answer but if it does, I know the prescription!